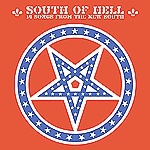 As long as I have been into rock 'n' roll the south has been producing many of my favorite bands. I was born and raised on 70s greats like BLACKFOOT, MOLLY HATCHET, LYNYRD SKYNYRD and ZZ TOP. Now in Y2K2 I can't seem to keep bands like EYEHATEGOD out of the ole CD player. This compilation is a look at the scene sparked by the likes of EHG, CAVITY and FLOOR. It features current favorites of mine like LEECHMILK (pure audio molasses), HAWG JAW (who will bust your jaw with their riffs) and MUGWART (the band that put the warts back on rock music). If you haven't had your head stuck in a vice while bubbling hot tar is poured over your face--you are in luck--because you can recreate the experience with fewer doctors' bills just by putting on this CD! My unwillingness to take this out of my CD player lately had led to some seismic instability around my hometown but I just don't care!